Anni Mann was born in Kent, England, and had her formative education there. After leaving school she trained as a dental nurse and then worked as a nanny, travelling with the families. 1991 Anni lived in London where she obtained a diploma for reflexology. She also qualified as a podiatry hygienist, which enabled her to combine her medical and holistic interests. 2001 Anni moved to Bermuda, working as a reflexologist and a podiatry hygienist. Here she completed further training in Reiki levels 1 and 2, after which she started her laser training. 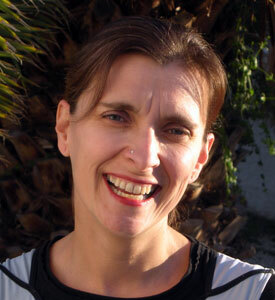 2007 Anni came to Spain to work as a reflexologist and a laser therapist. Anni is married with two young children and two cats. Her hobbies are painting, sewing and walking. Anni has helped many people kick the habit. She has seen people struggle with trying to give up cigarettes by themselves. They have tried other methods and then are not able to cope with certain situations without a cigarette. After a few weeks they have been defeated by the withdrawal symptoms and nicotine cravings. With this unique therapy you not only get the laser treatment but, once you are on the treatment programme, counselling and back-up support—whenever you need it. It is an easy and relaxing experience. If you want to know more, contact Anni on 635 757 672.